Last night, during yoga class none the less, I was thinking about what I was going to make for dinner. Not really what I should be doing in yoga class, but what ya gonna do. I really didn't feel like grilling out the steak and veggies I was planning on cooking, but yet really didn't want to eat a bowl of cereal either. I suddenly remembered the BBQ sauce I picked up at Whole Foods a month ago, and thought, yea, quick and easy dinner. I have a major love of BBQ sauce. I love all kinds, although I really prefer the ketchup based sauces as opposed to the vinegar based sauces. One of my biggest goals is to try BBQ from all over the country. I have so far tried it in North Carolina and Tennessee. 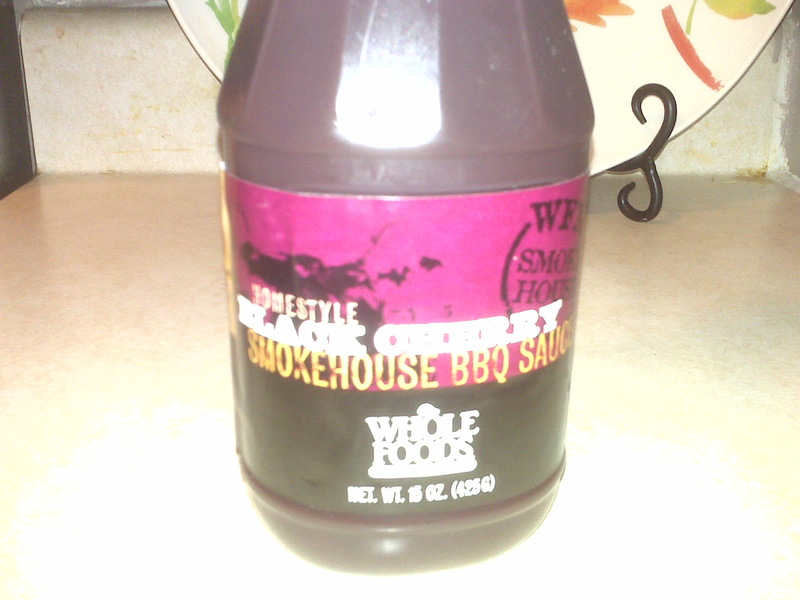 I saw the Neely's make a cherry BBQ sauce a while ago on their show Down Home with the Neely's and thought some day I needed to try it. When I came across this Black Cheery BBQ sauce at Whole Foods, I immediatly put it in my cart, even with the $4.99 price tag. This BBQ sauce is so thick and rich. It has a slight cherry flavor to it, but really it's just so sweet and smokey flavored. The first ingredient in it is black cherry puree, and then ketchup, brown sugar, brown mustard, sugar, lemon juice, liquid smoke and cinnamon. So far this has to be my favorite sauce, and unfortunatly I think it might be a seasonal item. I'll have to go back to Whole Foods and pray they still have some in stock and buy all that I can. If you get a chance, do pick some up. I just put a chicken breast in a pie dish, poured some BBQ sauce all over it, and then baked in the oven at 350 for 20 minutes. Along with some fresh corn on the cob, it was quick, easy and very tastey!